At its fifth session on June 18, 2007, the Council responded to this request and adopted, through resolution 5/1, detailed modalities regarding the UPR. Threshed out in particular were the basis of the review, principles and objectives to be followed, the periodicity and order of review of countries, process and modalities, as well as the outcome and the follow-up to the review. The HRC also decided that the review would be conducted in a working group composed of the 47 member States of the Council. At its sixth session on September 21, 2007, the HRC adopted a calendar in relation to the consideration of 192 Member States of the United Nations for the first four-year cycle of the UPR mechanism. The Philippines was selected among the 16 countries to be reviewed in the 1st UPR session on April 7–18, 2008. The scope of submission to the 2nd cycle must include information on the follow-up and developments to the recommendations for the State-under-review (SUR). The length of submission is fixed not to extend 2815 words for individual submissions and 5630 words for joint submissions. Developments since the previous review in background of the State under review and framework, particularly normative and institutional framework, for the promotion and protection of human rights: Constitution, legislation, policy measures, national jurisprudence, human rights infrastructure including national human rights institutions and scope of international obligations. The UPR outcome should be implemented primarily by the State concerned and, as appropriate, by other relevant stakeholders, including NGOs. Reflect on the role of Philippine NGO engagement in the UPR within a broader international advocacy strategy. Thirty Philippine civil society organizations took part in the training-workshop and decided to engage the Philippine government in the UN-UPR process. They identified key human rights issues and concerns on the ground, the Philippine government’s voluntary pledges and commitments made during its candidacy to the HRC, the existing mechanisms (both local and international) that protect and promote human rights, and the gaps in the promotion and protection of human rights vis-à-vis these mechanisms. Committees were constituted for the gathering of data, drafting, validation and submission of the NGO report. On November 20, 2007, the “Joint Submission by NGOs with Consultative Status and Endorsed by 29 Civil Society Organizations (JSNGO)” was received by the OHCHR. This was the official title of the NGO submission initiated by PAHRA, which was quoted 11 times in the OHCHR collation of reports. The JSNGO report was only one of the 31 civil society submissions to the UPR, including that of the Commission on Human Rights-Philippines (CHRP). For the 2nd Cycle of the UPR process, PAHRA again took the initiative to facilitate gathering of relevant civil society organizations in a series of workshop-consultation starting June of 2010. On November 28, 2011, in time for the submission deadline PAHRA submitted to the OHCHR a report entitled “Joint Civil Society Report for the 2nd Cycle Universal Periodic Review”. Sixty-three (63) CSOs collaborated to finalize the 2nd cycle report. In 2008, upon the official acknowledgement of the JSNGO report by the OHCHR, the secretariat for the UPR process, PAHRA through its International Affairs Committee embarked on both local campaign and international lobby. Information dissemination and discussion of the report with various stakeholders, including the media, highlighted the local initiatives. The international lobby included appointments with individual heads of various permanent missions in Geneva, meetings with the different UN Special Procedures in relation to their mandates, and establishing links with international NGOs and exploring possible areas of cooperation and complementation of work. A Philippine Lobby team was composed to form the PAHRA delegation to Geneva. The team met and discussed issues with various Permanent Missions and representatives of the offices of Special Procedures. While representatives of the Special procedures welcomed the team in their offices, meetings with country-diplomats/permanent missions were conducted during session breaks. Though meetings were informal, the discussions raised serious issues and concerns. The lobby succeeded in getting the commitments to bring to the session questions and recommendations regarding human rights in the Philippines. Countries like France, Canada, India, Mexico, Slovenia, Ghana, Thailand, Japan, Guatemala, Republic of Korea, Switzerland, UK, USA, Australia, Malaysia and the offices of the special rapporteurs on Torture, Human Rights Defenders, Terrorism, Internally Displaced Persons, Violence against Women, Enforced Disappearance and OHCHR were among the groups the team was able to meet. Out of the 18 Country Missions the team reached, 17 missions spoke during the interactive dialogue. 16 Missions carried the team’s questions and recommendations while only Thailand praised the Philippine Government. Malaysia declined to intervene, as it was a troika member for the Philippine review. On April 10, 2008, the Philippine lobby team together with other international NGOs and various government missions were invited to a luncheon with the Philippine government panel hosted by then Executive Secretary Eduardo Ermita, head of the panel. At the gathering, CSO representatives met with the government panel, during which the lobby team pointed out the gaps in the government report and gave recommendations for the government to consider. Issues like extrajudicial execution, torture, and housing and policies such as EO 197, Mining Act, and human rights protection and promotion, were raised. Recommendations like issuance of standing invitation to all special procedures, accession to OPCAT and CED, reporting to the treaty bodies and meaningful involvement of CSOs in government human rights processes were forwarded. For the 2nd UPR cycle, CSOs are still to discuss, plan and strategize an upcoming lobby effort to communicate its report and recommendations. Aside from meeting various delegations in Geneva, the team managed to present the JSNGO report to various international audiences, including Filipino communities in Switzerland. 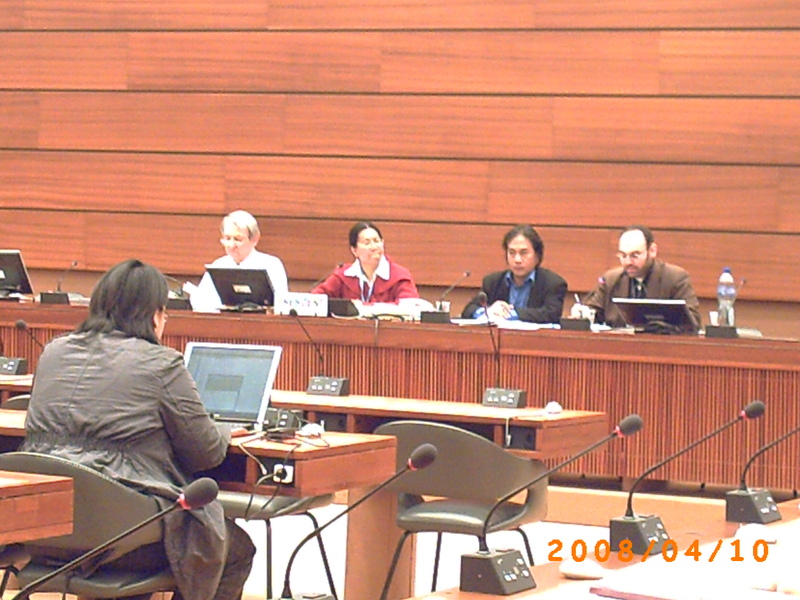 On March 19, 2008, the first civil society UPR side event on the Philippines was organized by Diakonie/Action Network Human Rights, Amnesty International and the World Council of Churches. Missions from Canada, Switzerland and Slovenia, together with the OHCHR-Asia Pacific Unit and INGOs, attended the event. 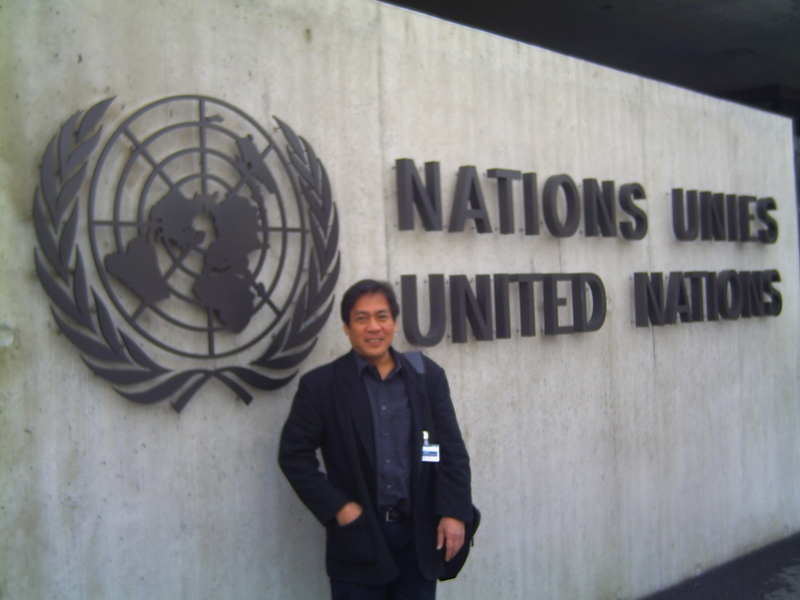 On April 11, 2008, hours before the Philippine review, the Philippine Civil Society was able to share its experiences on the preparation of the UPR process in the Philippines. This was jointly sponsored by the International Federation of Human Rights (FIDH), Forum Asia, Human Rights Watch, OMCT and PAHRA at the Palais des Nations. It was attended by Permanent Missions, the OHCHR, various International Non-Government Organizations and representatives from the Philippine Commission on Human Rights. It presented the gaps and challenges that need immediate attention by all stakeholders in the Philippines, particularly the state, as identified by the 31 separate submissions of civil society organizations. Had it not been for the vigorous NGO lobby for civil society participation in the UPR process, the side events would not have pushed through. There was reluctance on the part of the OHCHR Civil Society Unit that time to allow country-specific forums without the concerned government’s endorsement, due to pressure from some HRC members. In particular, some leaders from Arab and African nations were not open to NGO participation. They viewed NGO forums as venues for criticism and attacks against governments. As an attempt to block civil society voices, they drafted and circulated a non-paper modalities of the UPR which would have limited – if not closed off – NGO engagement within the UPR process. It is also important to note that while many NGOs pushed for the side events as improvements in a still-developing process, some International NGOs based in Geneva were willing to accede to government restrictions. It was their view that NGOs should not push the issue of the side event as it might result in a backlash to the overall NGO engagement in the whole UPR process. The OHCHR’s granting of the side events proved them wrong. The UPR Process of the Human Rights Council, though still evolving in terms of procedures and modalities, presents a venue for civil society organizations to engage governments on the real condition of human rights on the ground. It is with no illusion though that the process has a ready-made provision for CSO engagement. The process is a continuing challenge to assert CSO participation. As a process, it gives other governments a chance to look into the actual human rights situation within a country through the reports of civil society organizations. The nature of engagement the CSOs bring into the process will determine the relevance of the process to the people and communities they serve. It must never be forgotten that the UPR Process is a national process. As long as national CSOs remain grounded and continually engage their governments on the concrete human rights condition, the UPR as a whole will serve as window of opportunity for the continuing promotion and protection of human rights on the ground. Have you ever thought about adding more films to your blog site posts to maintain the readers further entertained? I reveal I just study all through the write-up of yours plus it was really excellent but as I’m more of a visual learner,I found which will to be more valuable properly let me understand how it turns out! I love all you guys are always up as well. These sensible work and filing! Keep up the splendid works guys I’ve truly added you guys for you to my blogroll. That is a outstanding article thanks for telling this informative details.. I will visit your web page regularly for some most recent post. On the one hand, the faith communities hold that human rights have their origin in the will of God for all humanity. ENGAGING GOVERNMENTS THROUGH THE UPR PROCESS (updated version) FREE ZONE is a good write-up. I will spend more time researching this subject.